This game was the first to feature three robots per alliance. The primary game pieces were called “Tetras” which are tetrahedra made from 1.25 in (31.8 mm) PVC pipe 30 in (762 mm) long. The game was played on a field set up like a tic-tac-toe board, with nine larger goals, also shaped as tetras in three rows of three. The object of the game was to place the scoring tetras on the larger goals, creating rows of three by having a tetra of your alliance’s color at the highest point on the goal. Triple Play was a strategically intensive game, requiring quick thinking on the part of the drivers and operators to optimize the field for their alliance. Tetras scored on the top of a goal were worth 3 points, while tetras contained inside the goals were worth 1 point. A goal was “owned” by the alliance whose color tetra highest on or inside the goal. Rows of three owned goals garnered the alliance an additional 10 points per at the end of regulation play. Ten points could also be scored if all three alliance robots were behind the alliance line at their end of the field at the end of the game. The playing field consisted of nine goals placed at equal intervals across the field in rows of three. 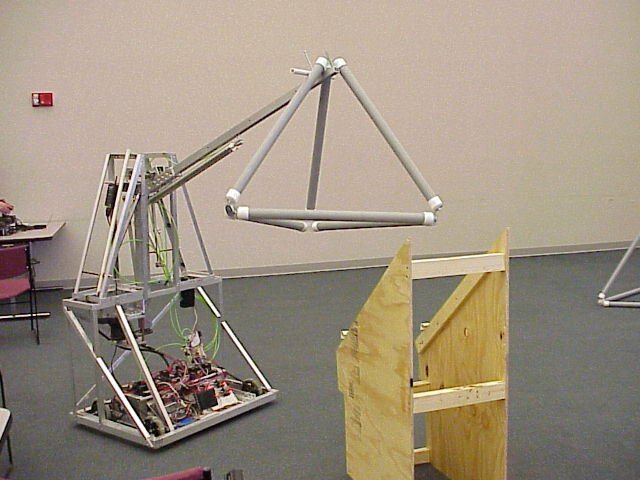 At the beginning of each match, the 4 corner goals had hanging tetras, and robots would be able to keep the tetras in the goals only if they knocked them down during the autonomous mode. On the side of the playing field were the automatic loading zones. These platforms were kept with a constant supply of a single tetra for a robot to pick up and bring into play. On the opposing side of the field was the Human Player Loading Zone, where human players could run out and hook a tetra on their robot. By doing this, however, a human player disabled their robot until such a time as they returned to their platform. In the spaces between the center row of goals and the home rows, four “Vision Tetras” were placed. A robot could locate these autonomously to score extra points, but were otherwise treated as regular tetras during regulation.